A decade has now passed since I first visited Mark and Glen Haldane’s Zambeze Delta Safaris (ZDS). I was extremely impressed the first time…but unlike some outfits and areas that peak and deteriorate or, at best, maintain a status quo; in that decade Zambeze Delta Safaris has continued to improve. Their hunting areas, Coutadas 11 and 12, 2.5 million acres of wild Africa, have steadily improved, with visibly more game of all species every year. Their logistics and equipment have continued to be upgraded. 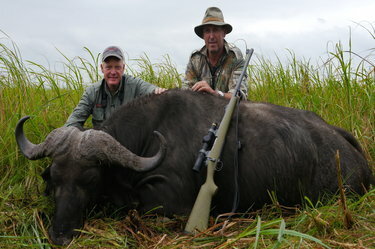 The professional hunters and camp staff are competent…and the leadership makes it all work.